The eight planets of our Solar System vary widely, not only in terms of size, but also in terms of mass and density (i.e. its mass per unit of volume). 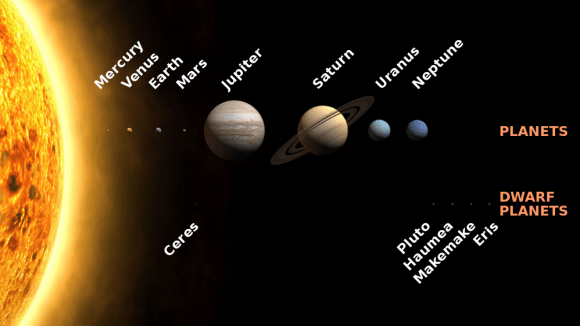 For instance, the 4 inner planets – those that are closest to the Sun – are all terrestrial planets, meaning they are composed primarily of silicate rocks or metals and have a solid surface. On these planets, density varies the farther one ventures from the surface towards the core, but not considerably. By contrast, the 4 outer planets are designated as gas giants (and/or ice giants) which are composed primarily of of hydrogen, helium, and water existing in various physical states. While these planets are greater in size and mass, their overall density is much lower. In addition, their density varies considerably between the outer and inner layers, ranging from a liquid state to materials so dense that they become rock-solid. Density also plays a vital role in determining a planet’s surface gravity and is intrinsic to understanding how a planet formed. After the formation of the Sun at the center of our Solar System, the planets were formed from a protoplanetary disc. Whereas the terrestrial planets resulted from dust grains in the inner Solar System, planets in the outer Solar System accreted enough matter for their gravity to hold on to the nebula’s leftover gas. The more gas they held onto, the larger they became. And the larger they became, the more matter they would accumulate, until such tie that they reached a critical point. Whereas the gas giants of Jupiter and Saturn grew exponentially, the ice giants (Uranus and Neptune), with only a few Earth masses of nebular gas, never reached that critical point. In all cases, density is measured as the number of grams per cubic cm (or g/cm³). Ad a terrestrial planet, Mercury is composed of metals and silicate material. Mercury’s mean density is the second-highest in the Solar System, which is estimated to be 5.427 g/cm3 – only slightly less than Earth’s density of 5.515 g/cm3.However, if the effects of gravitational compression – in which the effects of gravity reduce the size of an object and increases its density – then Mercury is in fact more dense than Earth, with an uncompressed density of 5.3 g/cm³ compared to Earth’s 4.4 g/cm³. These estimates can be also used to infer details of its inner structure. Compared to Earth, Mercury is much smaller, which is why it inner regions are subject to less in the way of compression. Therefore, its high density is believed to be the result of a large, and iron-rich core. All told, metals like iron and nickel are believed to make up 70% of the planet’s mass (higher than any other planet), while silicate rock accounts for just 30%. Several theories for this have been suggested, but the predominant one claims that Mercury had a thicker silicate crust earlier in its history. This crust was then largely blown off when a large planetesimal collided with the planet. Combined with its size and mass, Mercury has a surface gravity of 3.7 m/s2, which is the equivalent of 0.38 of Earth’s gravity (aka. 1 g). The second planet from our Sun, as well as the second-closest terrestrial planet, Venus has a mean density of 5.243 g/cm3. Again, this is very close to Earth’s own density. And while much remains unknown about Venus’ geology and seismology, astronomers have an idea of Venus’ composition and structure based on comparative estimates of its size, mass and its density. In short, it is believed that Venus’ makeup and internal structure are very similar to Earth’s, consisting of a core, a mantle, and a crust. Also like Earth, the interior is though to be composed of iron-rich minerals, while silicate minerals make up the mantle and crust. The slightly smaller size of Venus also means pressures are 24% lower in its deep interior than Earth’s. Because Venus and Earth have been cooling at about the same rate, it is believed that Venus’ core must be at least partially liquid. However, the lack of a magnetosphere around Venus has led scientists to question this, with some claiming that the core must be uniform in temperature, while others insist it is fully cooled and solid. Some has gone so as far as to suggest that it has no core. Earth has the highest density of any planet in the Solar System, at 5.514 g/cm3. This is considered the standard by which other planet’s densities are measured. In addition, the combination of Earth’s size, mass and density also results in a surface gravity of 9.8 m/s². This is also used as a the standard (one g) when measuring the surface gravity of other planets. Like the other terrestrial planets, Earth’s interior is divided into layers which are distinguished by their chemical or physical (rheological) properties. These layers consist of a core composed of iron and nickel, an upper and lower mantle composed of viscous silicate materials, and a crust composed of solid silicate materials. However, unlike the other terrestrial planets, Earth’s core region is divided into a solid inner core and a liquid outer core. 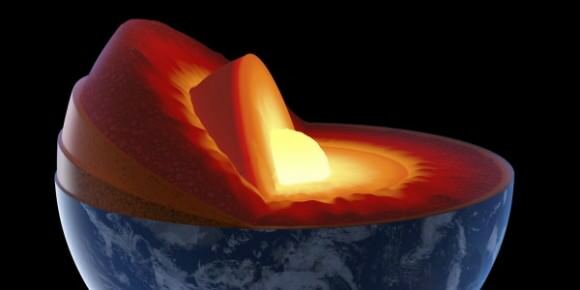 The inner core measures an estimated 1220 km and is composed of iron and nickel, while the outer core extends beyond it to a radius of about 3,400 km. The outer core also rotates in the opposite direction of the Earth’s rotation, which is believed to be the source of the Earth’s magnetosphere. Like all planet’s, this density increases the closer one gets to the core, reaching an estimated 12,600–13,000 kg/m3 in the inner core. As a terrestrial planet, Mars is also divided into layers that are differentiated based on their chemical and physical properties – a dense metallic core, a silicate mantle and a crust. The planet’s overall density is lower than that of Earth’s, estimated at 3.933 g/cm³, and this density increases the closer one gets to the core. Like Earth, this is due to the fact that the core is composed of iron and nickel, while the mantle is made up of silicate materials. Current models of its interior imply a core region about 1,794 ± 65 kilometers (1,115 ± 40 mi) in radius, consisting primarily of iron and nickel with about 16–17% sulfur. Compared to Earth’s crust – which averages 40 km (25 mi) in thickness – the average thickness of Mars’ crust is about 50 km (31 mi), with a maximum thickness of 125 km (78 mi). Between it’s size, mass, and density, Mars has a surface gravity of about 3.711 m/s² – which works out to 0.38 g.
As a gas giant (aka. composed largely of gaseous and liquid matter) Jupiter has a lower mean density than any of the terrestrial planets. However, at 1.326 g/cm3, it is also the second-most dense of the gas giants. Despite their incredible size and mass, the lower density is due to them being largely composed of noble gases, which are maintained in states ranging from gaseous to solid. In addition, this density ranges considerably between its outer gaseous layers and its core, which is believed to be composed of rock and surrounded by a layer of metallic hydrogen. In the outermost layer, which are made up of elemental hydrogen and helium, the density of the materials is less than that of water – 0.0002 g/cm³ compared to 1 g/cm³ of water. 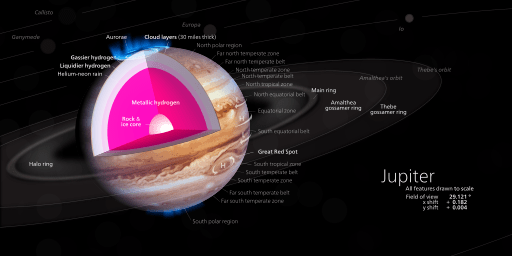 Beneath that, where the planet’s hydrogen are in a liquid state, the density rises to roughly 0.5 g/cm³ and increases to 1 g/cm³ at the boundary with the layer composed of metallic hydrogen. The layer metallic hydrogen, meanwhile, has an estimated density of 4 g/cm³ – i.e. around the same as Mars. And in the core, who’s composition is still the subject of speculation, the density rises to 25 g/cm³. Thought its average density is lower than that of the terrestrial planets, Jupiter’s overall size, mass, and the amount of material it packs into it frame makes for some powerful gravity. Measured from its “surface” (which in this case means its cloudtops), Jupiter’s gravity is over two and a hlaf times that of Earth – 24.79 m/s2, or 2.528 g.
At 0.687 g/cm3, Saturn is the least dense of the gas giants. In fact, it’s mean density is actually lower than that of water, which means that if it were possible to place the planet into a tub of water, it would float. But as with Jupiter and the other giants, this density ranges considerably from the plant’s exterior (which is composed of elemental hydrogen and helium) to its core (which is again believed to be rocky, and surrounded by metallic hydrogen). Owing to its greater size but lower density than terrestrial planets, Saturn’s surface gravity (again, measured from its cloudtops) is just slightly higher than that of Earth’s -10.44 m/s² or 1.065 g.
With a mean density of 1.27 g/cm3, Uranus is the second-least dense of the gas giants, after Saturn. Its slightly higher density is due to its composition, which consists primarily of various volatile ices – such as water, ammonia, and methane – in addition to gases like hydrogen and helium. For this reason, Uranus (and Neptune) are often referred to as “ice giants” to differentiate them from Jupiter and Saturn. The standard model of Uranus’s structure is that it consists of three layers. Like the other giants, this includes a rocky core and an outer layer of hydrogen and helium. But in Uranus’ case, these layers are connected by an icy mantle in the middle rather that one made up of liquid hydrogen. The presence of methane in its atmosphere is also what gives Uranus’ its particular hue. Uranus’ overall size, mass, and density also mean that its surface gravity is less than that of Earth’s. All told, it works out to 8.69 m/s², which is equivalent to 0.886 g.
Neptune’s mean density is 1.638 g/cm³, making it the most dense of any of the giants. Like Uranus, its is composed of higher concentrations of volatiles relative to Jupiter and Saturn. 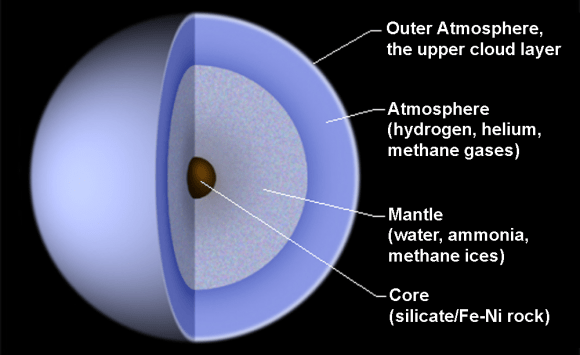 Also like Uranus, its interior is differentiated between a dense core consisting of silicates and metals, a mantle consisting of water, ammonia and methane ices, and an atmosphere consisting of hydrogen, helium, and methane gas. The higher concentrations of methane in Neptune’s atmosphere is why it is darker in hue than Uranus. And between its size, mass and density, Neptune has a surface gravity of 11.15 m/s2 – which is the equivalent of 1.14 g.
As you can see, the densities of the Solar planets varies widely. Whereas those that are closer to the Sun are terrestrial and quite dense, those that inhabit the outer Solar System are largely gaseous and liquid, and are therefore less dense on average. We have written many interesting articles about the densities of planets here at Universe Today. Here is the Density of Venus, the Density of Earth, the Density of the Moon, the Density of Mars, the Density of Saturn, the Density of Uranus, and the Density of Neptune. If you are looking for more information, check out NASA’s Solar System exploration page, and here’s a link to NASA’s Solar System Simulator.